Preparing for college can be extremely stressful for students. As a parent you can help your student navigate the difficult admissions process by better preparing them for the SAT & ACT exams. With our helpful guide you can understand the ins and outs of these challenging tests with ease. Learn the difference between the SAT & ACT Exams including test structure and scoring. Learn how to decide which test is best for your child. Learn about test planning and exam time schedules. Learn about TestRocker and how we can help you prepare for the test. 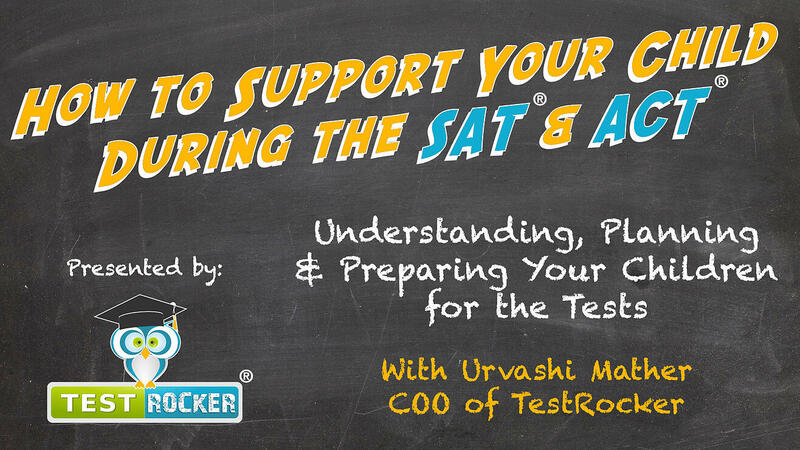 TestRocker COO Urvashi Mathur will teach you everything you need to know to support your child! The best way to prepare your students is to be prepared yourself. To view a recording of this helpful webinar simply fill out the form on the left hand side of this page. Take this important first step in supporting your child during the SAT & ACT exams! SAT & ACT are registered trademarks of College Board and ACT Inc, respectively. Share this webinar with friends!